Thirteen-year-old Jack Churchill has completed a sponsored bike ride to raise funds for Cats Protection’s Derby Adoption Centre. Cat lover Jack cycled 30 laps of Normanton Park in Derby which works out at 18.2 miles. 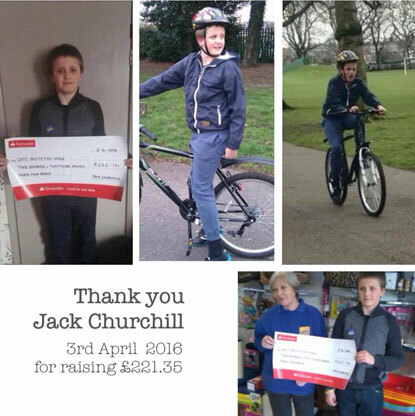 He was sponsored by family and friends as well as staff and pupils at his school to raise £221.35. He started the bike ride at 9am on a Friday morning during the Easter holidays, stopping every 10 laps for a break, completing the challenge in just over two hours. Jack and proud parents Gemma and Andy presented the money to the charity two days later.